MeineBase® alkaline mineral bath salts are well-suited for full baths, hip baths and showers, for foot- and hand baths and for different kind of wraps. Stay true to the 10,000-year-old tradition of alkaline body care! MeineBase® alkaline mineral bath salts are well-suited for full baths, hip baths and showers, for foot- and hand baths and for different kind of wraps. Alkaline body care with an optimum pH value of the bath water of pH 8.5. Three tablespoons of MeineBase® Mineral Salt suffice for a full bath. One tablespoon for a hip bath. We recommend a bath temperature of 36-38 °. A period of at least 30 minutes. One tablespoon of MeineBase® Mineral Salt. We recommend a bath temperature of 38–41 ° C.
One teaspoon of MeineBase® Mineral Salt. For this, mix a pinch of MeineBase® with a body cleanser, and rub your body. 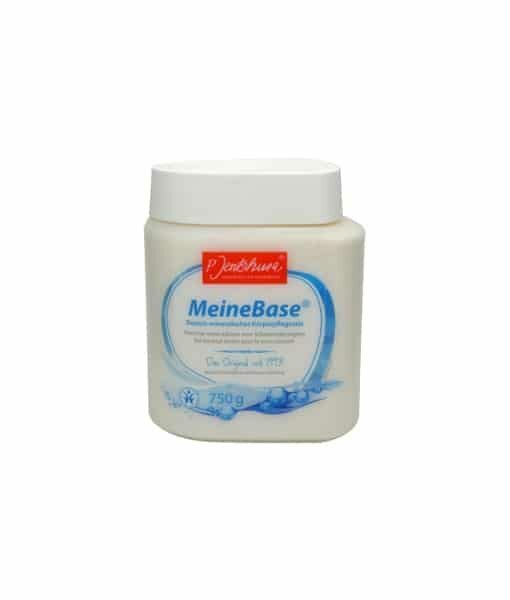 Also, MeineBase® can also be used purely on your skin. Then just rinse off. You sweat first about five minutes. Apply some MeineBase® to the body and lightly rub the salt. Sweat for 10 minutes and then wash off. Mix with honey; MeineBase® can be mixed with honey for a more intensive treatment. To do this, mix liquid honey and a little water to make a spreadable paste and add a tablespoon of MeineBase®. Sweat first about five minutes, apply some paste, let soak for 10-15 minutes and rinse with water after the steam bath. Dissolve half a teaspoon of MeineBase® in 250 ml of warm water. Swiss a squirt of this liquid in your mouth, or more if you wish to gargle. To do this, take a half cover or one teaspoon of MeineBase® to one litre of boiling water in a bowl. Use a high-quality skin oil and mix this with MeineBase®. The lid of the packaging is at the same time a lock and a practical dosing aid. Two marks are on the top. If you fill the lid up to the outer marker, this is equivalent to one tablespoon. The filling is equivalent to a teaspoon to the inner mark.